Hindus in Trincomalee town at the conclusion of annual Navarathiri (Nine auspicious nights) religious event celebrated the more than two hundred year old Kumbam festival Sunday evening with pomp and pageantry. Specially constructed "Kumbam" from Hindu temples in the district were taken in procession across the east port town throughout the night of Sunday. Hindu devotees received Kumbams (silver pots decorated with margosa leaves and colored papers to form a tower upto eight to ten feet) which were carried by devotees who fasted for nine days of the Navarathiri. 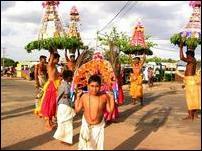 Trincomalee was in a festive mood Sunday evening as people gathered at every junction of the town to receive Kumbams. All "Kumbam" finally arrived at the Trincomalee esplanade by Sunday midnight where the "Manampoo" religious rites were held in the presence of chief deities of Pathirakali Amman Temple and Muthumariamman Temple. Hundreds of devotees gathered at the site to witness the event, sources said. Every Hindu temple in Trincomalee town starts constructing KUMBAM from the first day of Navarathiri religious observances begin. 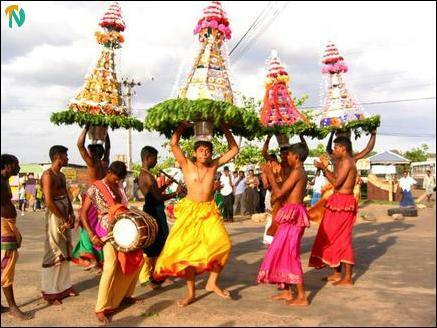 The Kumbam celebration is held only in Trincomalee . Sikh soldiers brought by the Britishers to Sri Lanka (then Ceylon) to construct the Trincomalee naval yard introduced the Kumbam festival to locals. Since then long after Indian Sikhs soldiers left the country Hindus in Trincomalee continue to celebrate it at the end of Navarathiri festival. 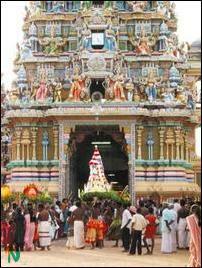 The first three days of Navarathiri is dedicated for Bravery by worshipping Goddess Thurgai. The second three days for Wealth by worshipping Goddess Lakshmi. The final three days for Education by worshipping Goddess Saraswathy. Wijeyathasami day is celebrated at the conclusion of Navarathiri which is an annual festival celebrated by Hindus across the world, especially in India and Sri Lanka. 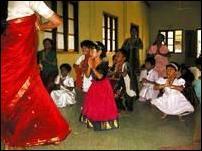 On the Wijethasamy day, children who reach school going are taught alphabets of their mother tongue. Hindu schools organized special ceremonies to children who reached school going age to write alphabets of their mother tongue for the first time. In addition students who desire to learn vocal carnatic music, Baratha Natyam dance and other musical instruments such as Violin, Veena, Miruthangam are enrolled in institutions that conduct these classes. 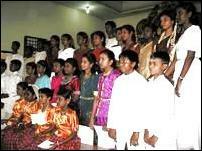 In Trincomalee new students for these classes were enrolled Sunday evening at an event held at Muttucumara Swamy temple wedding hall under the auspices of Muttucumara Swamy Thevasthanam Music and Dance School which has been conducting these classes free of charge, sources said.